Pope Pius II Piccolomini visited his hometown of Corsignano in 1459 and found out that he’d grown up in a bit of a dump. 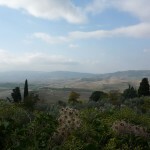 He promoted it to the level of city-state, imposed upon it a new urban plan that corresponded with utopic standards, and renamed “Pienza” it after himself. The things you can do if you’re Pope! Here follows a useful history of this town and what to see there. 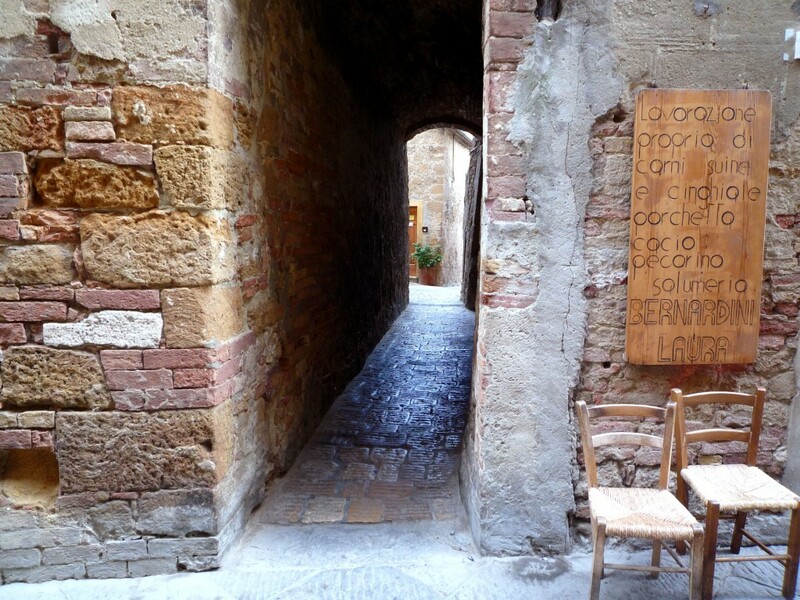 The newly developed center of Pienza reflects the urbanistic ideals of the humanist and theorist Leon Battista Alberti, who probably accompanied the pope on his 1459 visit. In his De re aedificatoria of 1452 Alberti, based on Vitruvius, proposed that the main palace in a city should be in a central piazza, adjacent to the temple, theatre, and the houses of other noblemen. 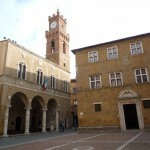 Correspondingly, the central square at Pienza (Piazza Pio II) is the site of the Palazzo Piccolomini (papal palace), Duomo (Cathedral), government office in the Tuscan tradition (Palazzo Comunale), and the Episcopal Palace. 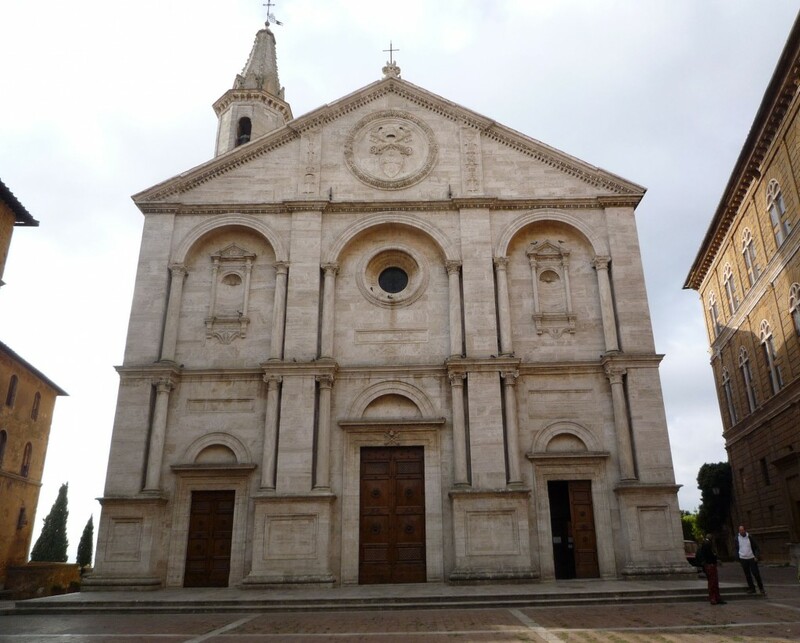 The piazza is trapezoidal, with the church at center and the two palaces (episcopal and papal) at an angle on either side, creating a sense of monumentality in a rather shallow area limited by a street at the far end. 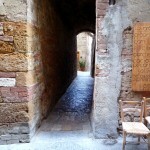 Along this main street, about forty other buildings were either constructed or refurbished in the Renaissance style. The concept behind this rennovation is essentially utopic; that every element necessary to harmonious city life be accessible in one area to all citizens. 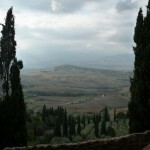 Pius took a heavy hand in forcing cardinals of other cities to build palaces in Pienza, and even planned to flood the lovely Orcia valley to create a lake for fish supply, but his death in 1464 stopped progress on the city and its inhabitants returned to their previous, mostly agricultural pursuits. 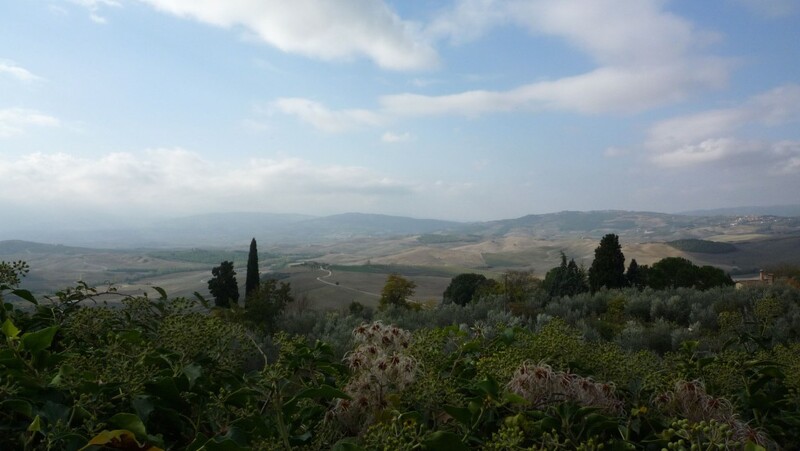 Nonetheless, the pope’s plan remained virtually unchanged, and Pienza is thus a rare example of a perfect Renaissance city. 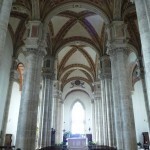 The interior of the cathedral is unusual because it imitates a German Late Gothic hall church of the type Pius had admired on his travels as a young apostolic secretary and ambassador. 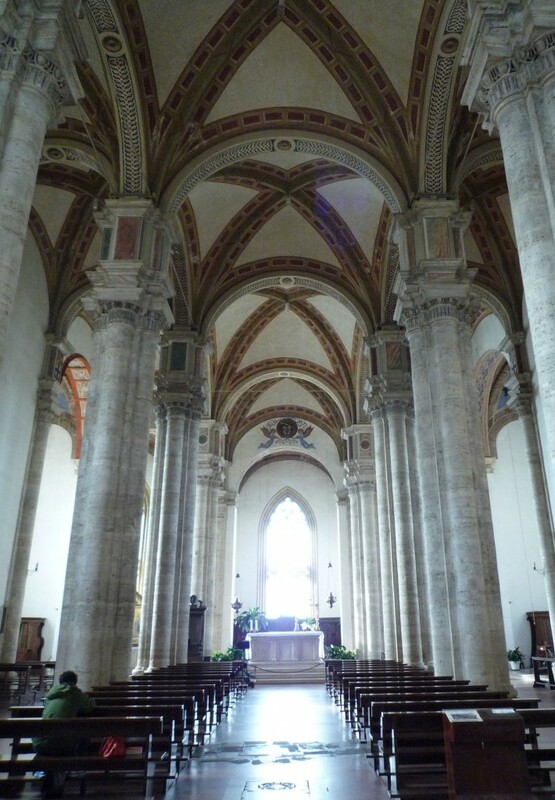 Unlike most Italian and Siennese buildings, this church has three aisles of equal height, and it incorporates architectural features that are both Renaissance and Gothicizing. 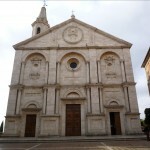 The Duomo facade is articulated by four colossal pilasters on pedestals, reaching to the horizontal cornice of the pediment without any intervening entablature. Pius described the façade as being ‘modelled on those Ancient temples and richly decorated with columns and arches and semicircular niches designed to hold statues’ (Grove art online). My friend and colleague Roy is a fan of hiking, and of eating anything he can find on said hikes. 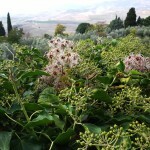 Walking outside Cortona, he found a beautiful mushroom that he said was a puffball, or at least it looked like the puffballs he knew in the USA. Before cooking it up with tagliatelle, he had the prudence to have it examined by an expert. The question was, where in Italy should you ask? So, Roy asked me, and I told him to go to the Carabinieri. I have never found edible mushrooms myself, but I had a flashback to my childhood summers in Switzerland and I could have sworn that the police were in charge of these things. Well, Roy trekked into the Carabinieri station on via Dardano in Cortona with his puffball and said in broken italian to the 18 year old kid on duty “Conosci funghi?”. The kid looked at Roy like he was crazy, and eventually lead him by the arm to a restaurant down the street, whose cook confirmed that the mushroom would indeed be delicious, and not kill anyone. I got a good laugh at his expense. 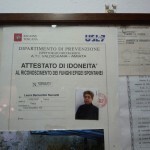 So back to Pienza: At the panino place, I spotted a framed sign behind the glass display (see photo). 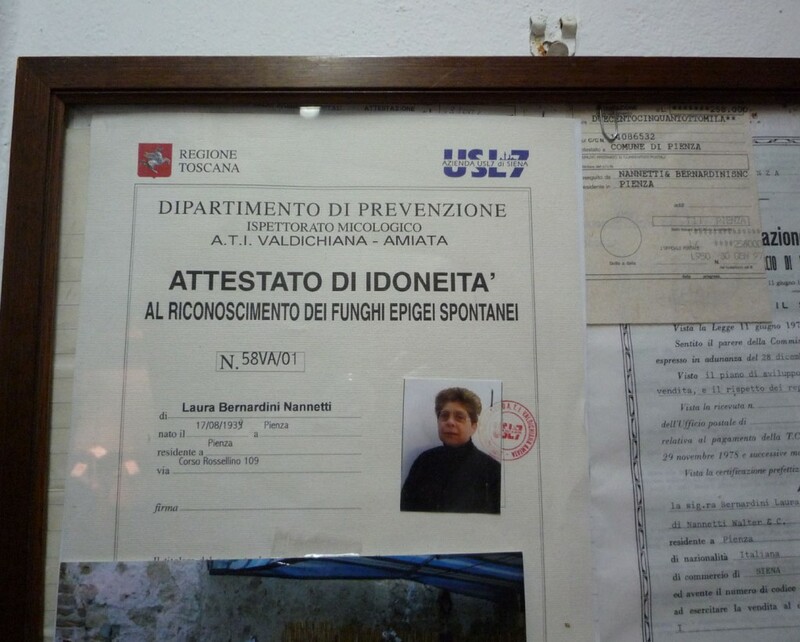 The owner of this locale, photographed mug-shot style, is a licensed authority on mushrooms, within the regulation of the local USL7 of Siena (the company that runs the health system). With this I learned that, if you ever have a mushroom you pick in a field, you should run it by an expert in “consulenza micologica”, of which, for the region of Siena, there is a list here.